In-store customer experiences are important because first impressions last. This is why we encounter lavishly branded point of sales displays, featuring demonstration models, multimedia displays, take-home glossy marketing flyers, life-size cardboard cutouts of dinosaurs and so on. It’s a vital step on the customer journey, but what if your product’s unique selling points are invisible, like voice controlled smart speakers? Amazon’s smart speakers are called Echo (Amazon Echo, Echo Dot, Echo Plus, Echo Spot and Echo Show). Except everybody calls them Alexa, the name of the voice assistant AI they use. So customers often think they want “an Alexa” but the store display is full of Echos. And the Amazon Fire Stick (which also has Alexa). But they won’t find an Alexa for sale. We’ve observed a number of customers looking at Google Home and calling it “Google’s Alexa” too. Add into the mix offerings from Eufy, Apple, Mobvoi, UE (and many more) and so the naming confusion increases. It’s highly unusual to have a product on display that people call the wrong names by default. Except for vacuum cleaners. They often get called ‘hoovers’ even if they’re made by Dyson. Interestingly though, ‘Dyson Hoover’ is technically more accurate than ‘Google’s Alexa’, because the thing called Alexa isn’t actually a category of product or for sale, unlike hoovers, no wait… vacuum cleaners. 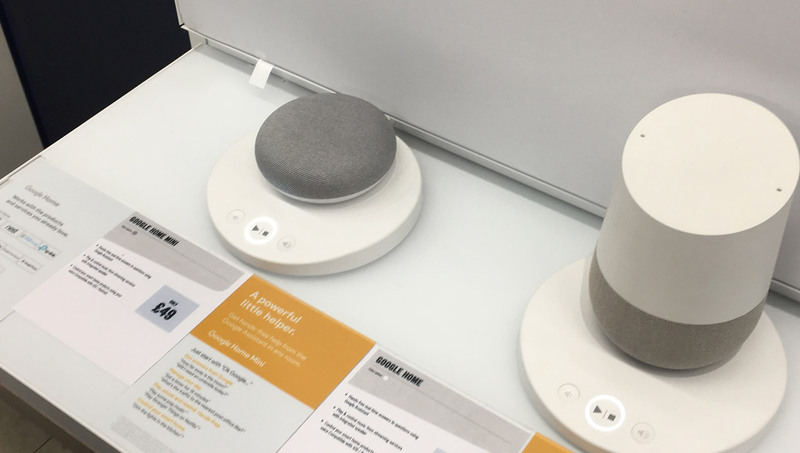 We’ve seen some displays where all the smart speakers share the same patch of store real estate, so the Alexa range – sorry, Echo and Fire Stick range – are next to Google’s competitor range (Google Home and Google Home Mini) and the voice controllable Google Chromecast Ultra. They all use Google Assistant, which some people refer to as ‘Okay Google’ or ‘Hey Google’ – the wake words to switch it on – or Google Now, which is the Android / iOS voice assistant. “That’s the Okay Google TV dongle”… that’s a whole lotta product name confusion concentrated into a small patch of floor space, because there’s also possibly a Sonos One, a UE Megablast, a Eufy Genie, a Mobvoi Tichome (etc.) and they use Alexa, and Google Assistant. And neither, if it’s an Apple Homepod with Siri. Or something else. And they called get called the wrong name by someone, all the time. Wake up… er… what was your name again? You can select various wake words for your Amazon device – Amazon, Echo, Alexa, Computer – or press a mic button on the device (and your Fire Stick remote) in which case, you don’t need a wake word. For Google devices, you can say “Hey Google” or “Okay Google” (or press a button if you prefer on Google Home). Calling Alexa “Computer” is doubly misleading because it’s not a computer, and these words access the voice assistant service, so in the case of “Amazon”, “Echo”, “Hey Google” and “Okay Google” none of those wake words are actually the name of the voice assistant you’re talking to, which confuses people because we normally address talking things (and pets) by their actual name. Apple’s Homepod wakes to “Hey Siri”, and so people call Siri “Hey Siri” and variations, too. And not all of these wake words work in-store anyway, it depends on how the demo unit is set-up. 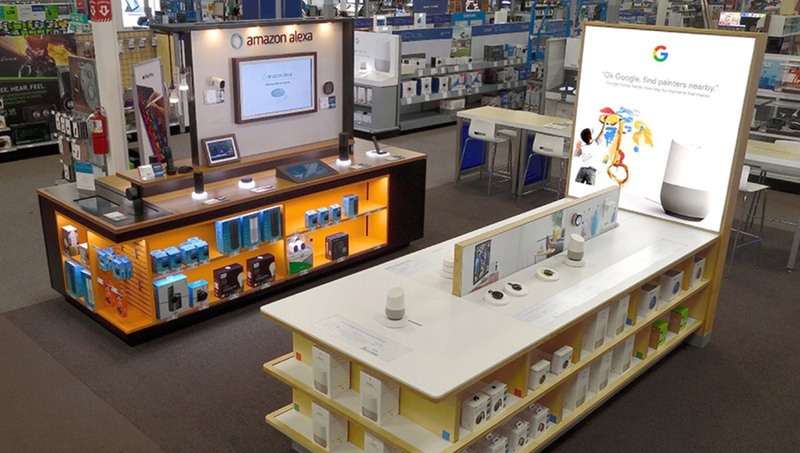 Another common friction point for demonstrating smart speakers and voice assistant enabled gadgets in-store is… being in a store. Shops are noisy acoustic environments, and our experiences as we went on safari around big warehouse stores, small boutique stores, mall displays and department store electronics installations shows one big problem for all brands of smart speakers… noisy environments increase the failure rate of voice interactions. To get around this, in-store demo units are often wired-up to demo buttons. The customer presses the button, the digital voice gadget does its thing. That seems like a good workaround, except the whole point of voice tech is not pressing a button. Stranger still, if you decide to activate the device by pressing the activate button on the device, it’s not the same as pressing the in-store demo button, which activates the device demo in the store. So that’s… er… what? We’ve observed customers asking if the store demo button is part of the product, which leads to awkward conversations because the answer is “no, but it doesn’t work well in here because it’s too noisy so…” which sounds like a flaw in the product, even though it isn’t. The challenge here is voice interfaces are screenless, so there’s no affordance – clues offered by the physical appearance of a thing to suggest how to use it – which means it’s hard to show how the product on display actually works without using your voice. And you can’t use your voice effectively in many shops because it’s too noisy. The smart speaker phenomenon is fascinating. These devices are a new kind of technology, designed for a home or office context. Seeing them in the home makes the obvious utility and huge potential of these new devices obvious, but seeing them in a store doesn’t. That means, curiously, smart speakers and voice assistants are a bit like showers, baths and toilets: Extremely useful things, but it’s best to avoid trying them out for real on a display stand in the middle of a shop.